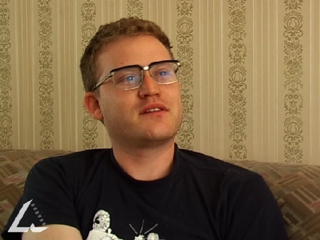 Video clip synopsis – John Safran discusses censorship in Australian media. Broadband MP4 censorship_bb.mp4 (2.0MB), suitable for iPods and computer downloads. deliver a speech to a defined audience about an aspect of censorship. Reading Standard: students read, view, analyse and discuss contemporary and discuss a wide range of informative and persuasive texts and identify the multiple purposes for which texts are created. They explain how texts are shaped by the time, place and cultural setting in which they are created. Writing Standard: students write sustained and cohesive narratives that experiment with different techniques and show attention to chronology, characterisation, consistent point of view and development of a resolution. They write persuasive texts dealing with complex ideas and issues and control the linguistic structures and features that support the presentation of different perspectives on complex themes and issues. They proofread and edit their own writing for accuracy, consistency and clarity. The activities in this unit are relevant to the Interdisciplinary Learning strands of Level 6 Communications(Listening, Viewing and Responding standard; Presenting standard), and Thinking Processes (Reasoning, Processing and Inquiry standard; Creativity standard). The activities are also relevant to the Physical, Personal and Social Learning strand of Level 6 Interpersonal Development (Building Social Relationships standard; Working in Teams standard), and Personal Learning(The Individual Learner standard; Managing Personal Learning standard). The Government used its influence over radio, newsreel and the print media during World War II (1939-45), in an attempt to control the way in which the war was reported. Information was carefully used by the media as a tool for managing public opinion and boosting morale. In some instances reports distorted the truth by, for example, minimising the number of casualties or the extent of damage. Sometimes significant current events were not reported at all, such as the death of approximately 243 Australians following the Japanese bombing of Darwin. Sir Keith Murdoch, the Managing Director of the Herald and Weekly Times Ltd. (and father of Rupert Murdoch), was made Director-General of Information, with the power to control 'every avenue of publicity’. the United States’ General Headquarters in Melbourne. Mentions of media censorship were suppressed, and the Government threatened penalties for breaches of censorship. Despite people’s recognition of the role of censorship during a time of national emergency, many, including those involved in producing broadcasts, criticised the Government’s censorship of the media as too extreme, and some even compared the suppression and interference to Dr Goebbels’ Department of Propaganda and Enlightenment in Nazi Germany. Define John Safran’s view of what he calls the ‘traditional’ meaning of censorship, and comment on whether he believes this form of censorship occurs in Australia or not. Comment on whether governmental controls over swearing, sexuality and violence in films and TV fiction programs serve a positive purpose within Australian society, or whether there should be no censorship and control over these at all. Comment on whether there are any newspaper photographs or TV news programs of real-life events that contain images you believe should never be published or screened. Are there any you have seen that ought to have been censored? In pairs research either newspaper, newsreel or radio censorship in Australia during World War 2, then construct a large illustrated poster display about it. The class should make sure posters are produced dealing with all three areas of the mass media. You belong to a team constructing a fight-scenario computer game that has been criticised for being excessively violent. Prepare a two-minute speech to the Office of Film and Literature Classification arguing why the game should not be censored. Present to your class. Go to Parliament of Australia, Parliamentary Library, Censorship and Classification in Australia, Kim Jackson, Analysis and Policy, Social Policy Group. Trinity College, PL Duffy Resource Centre, Censorship: Ever Justified?